An atrial septal aneurysm (ASA) is a rare but well recognized and localized saccular deformity of the atrial septum that bulges into the right or left atrium with uncertain clinical significance. , Diagnosis can be established using transthoracic (TTE) and transesophageal echocardiography. Although these abnormalities are considered clinically benign entities, they have been independently associated with ischemic stroke. , We present a small atrial septal aneurysm in a child with left middle cerebral artery (MCA) stroke. A 6-year-old male presented with vomiting for 2 days and inability to speak with right-sided hemiparesis for 1 day. He was conscious with no other symptoms. Physical examination revealed right facial palsy, a mid systolic murmur best heard at the apex, right upper and lower limb grade IV power with planters up-going, blood pressure was 90/60 mm hg. Electrocardiogram showed sinus rhythm. Chest X-ray was normal. Laboratory findings including complete blood count, liver functions test, erythrocyte sedimentation rate, and cerebrospinal fluid analysis as well as coagulation screening presented no abnormalities. Electroencephalography (EEG) and routine 48 h ambulatory (Holter) ECG were normal. Brain computed tomography (CT) scan showed ischemic infarct in the vicinity of left middle cerebral artery. Magnetic resonance imaging of brain confirmed the findings of the CT head, Doppler sonography of lower extremities excluded deep vein thrombosis, and transthoracic echocardiography revealed a small atrial septal aneurysm. According to Hanley's diagnostic criteria, atrial septum is considered to be aneurysmal, when a dilated segment protrudes at least 15 mm beyond the level surface of the atrial septum. An echo contrast was also performed in order to exclude patent foramen ovale. The images recorded were not diagnostic of right to left shunting. 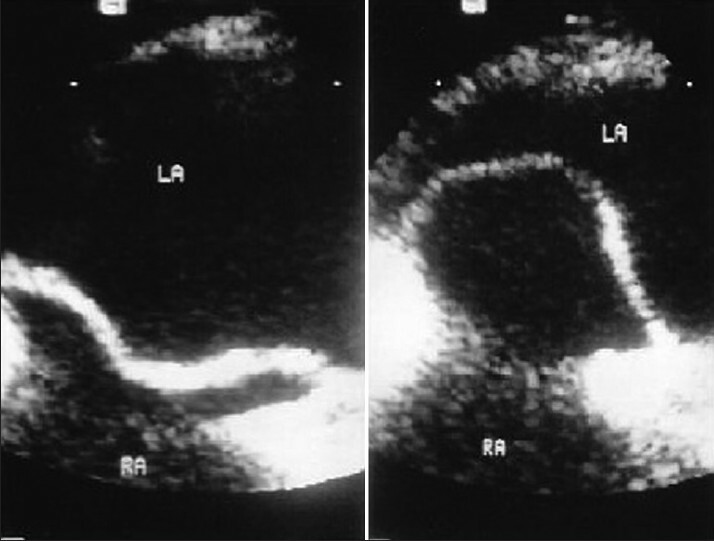 A transesophageal echocardiography confirmed the findings of transthoracic echocardiography [Figure 1]. The patient was started with warfarin in loading doses of 0.2 mg/kg body weight followed by maintenance doses of 0.1 mg/kg B.W. He improved and was discharged from the hospital a week after admission with no neurological deficit. An aneurysm of the interatrial septum is an infrequent finding in adult patients. Atrial septal aneurysm is a congenital malformation of the septum primum layer of the interatrial septum but differences between interatrial pressure forces have also been reported as a cause of its development. The widespread availability of transthoracic and transoesophageal echocardiography has identified atrial septum aneurysm with increasing frequency. The frequency of the anomaly in the general adult population is low (2.2%). It has been speculated that ASA is a direct source of thrombus formation. This is supported by anecdotal findings demonstrating thrombotic material within the aneurysmal sac in the patients at autopsy  or cardiac surgery. The mechanism of stroke in patients with ASA remains poorly understood. Cerebral embolism might result from paradoxical embolism of venous thrombi across a right to left shunt, passage of a thrombus created on the left atrial side of the aneurysm with atrial fibrillation. In our case, brain CT and MRI demonstrated ischemic infarcts that possibly reflected cryptogenic stroke in a patient with isolated small atrial septal aneurysm. Thrombus formation on the left atrial side of the aneurysm appears to be the most possible underlying mechanism. Bulging of the aneurysm that extends to the portion between the primum and secundum atrial septum and thus leading to a minor interatrial communication that allows paradoxical embolism, which seems to be a less possible explanation. This case highlights that the presence of an isolated small ASA may be possible risk factor for ischemic stroke even in the pediatric age group; till date there is not much literature available in the pediatric age group. Further prospective studies need to be conducted in order to elucidate the mechanism between such cardiac abnormalities and ischemic cerebral disease. 1. Silver MD, Dorsey JS. Aneurysms of the septum primum in adults. Arch Pathol Lab Med 1978;102:62-5. 2. Gondi B, Nanda NC. Two dimensional echocardiographic features of atrial septal aneurysms. Circulation 1981;63:452-7. 3. Gallet B, Malergue MC, Adams C, Saudemont JP, Collot AM, Druon MC, et al. Atrial septal aneurysm a potential cause of systemic embolism. Br Heart J 1985;53:292-7. 4. Belkin RN, Hurwitz BJ, Kisslo J. Atrial septal aneurysm: Association with cerebrovascular and peripheral embolic events. Stroke 1987;18:856-62. 5. Hanley PC, Tajik AJ, Hynes JK, Edwards WD, Reeder GS, Hagler DJ, et al. Diagnosis and classification of atrial septal aneurysm by two dimensional echocardiography: Report of 80 consecutive cases. J Am Coll Cardiol 1985;6:1370-82. 6. Schneider B, Haurath P, Vogel P, Meinertz T. Improved morphologic characterization of atrial septal aneurysm by transoesophageal echocardiography: Relation to cerebrovascular events. J Am Coll Cardiol 1990;66:761-4. 7. Grosgogeat Y, Lhermitte F, Carpentier A, Facquet J, Alhomme P, Tran T. Aneurysm of the interauricular septum revealed by a cerebral embolism. Arch Mal Coeur Vaiss 1973;66:169-77. 8. Mugge A, Daniel WG, Angermann C, Spes C, Khandheria BK, Kronzon L, et al. Atrial septal aneurysm in adult patients. A multicenter study using transthoracic and tarnsoesophageal echocardiography. Circulation 1965;91:2785-92. 9. El-Chami MF, Hanna IR, Helmy T, Block PC. Atrial septal abnormalities and cryptogenic stroke: A paradoxical science. Am Heart Hosp J 2005;3:99-104.